NMC's board of trustees: Front row: Rachel A. Johnson, Jane T. McNabb; middle row: K. Ross Childs, Michael Estes, Kennard R. Weaver; back row: Douglas S. Bishop, Chris M. BottFine-tuning the qualities desired in NMC’s next president with input from stakeholders, developing a presidential profile and managing the search timeline are among the immediate tasks facing Pauly Group, Inc., the presidential search consultant college trustees selected this week. 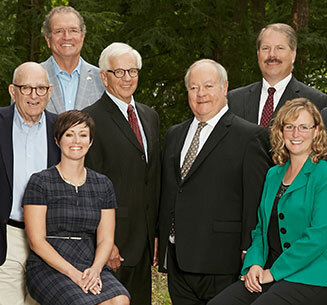 Trustees’ selection of Pauly Group, an Illinois firm with extensive experience in Michigan, was unanimous. Current NMC President Timothy J. Nelson will retire at the end of this year after assuming the office in 2001. “Hiring a president hasn’t occurred for 19 years,” said board chairman Chris Bott, noting that only one current trustee, Ross Childs, was involved with Nelson’s hiring. “They’re a great firm to guide us through this process. Trustees cited the depth of Pauly Group's experience in Michigan as among the factors that set the Springfield, Ill.-based company apart from three other finalists interviewed last week. In its references, Pauly Group cited the placements of the current presidents of North Central Michigan College in Petoskey (2018), Lake Michigan College in Benton Harbor (2017) and Mott Community College in Flint (2014). Completion of the West Hall Innovation Center. Follow updates here.